Ever wondered how we do what we do so well? 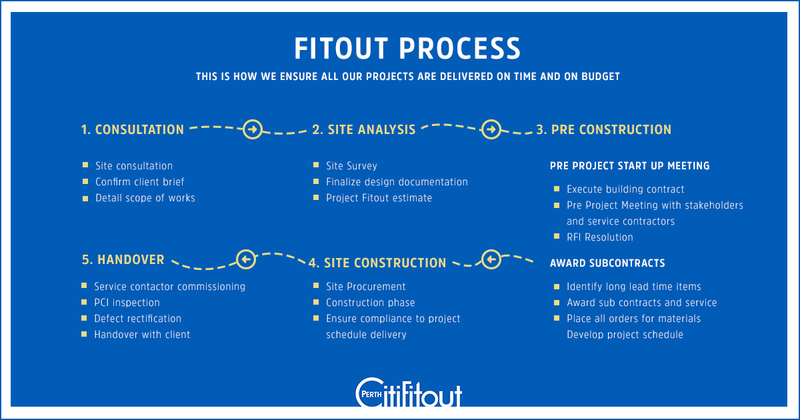 Since we started Perth Citi Fitout we knew that we wouldn’t be able to manage our jobs without a simple, foolproof workflow. So we developed this process with our team and we were constantly refining it until we had developed our five step process we use daily. We thought that there’s no reason to keep our process a secret so we share this with all of our clients before construction starts. Like most things we found that transparency is key especially when it comes to project management so by us sharing our workflow with you sets the right expectation for your build. The consultation phase is our first meeting with you, our client. It’s where you show us your space and tell us about what you want your space to be. You can also show us images of what you like and don’t like for us to get a greater understanding of your vision and goals. From there we detail the scope of work and understand your fitout requirements. This is the stage where we visit your site with our team. We do a site survey, finalise the designs and documents and produce an estimate for the fitout. Then we sit down with you again, discuss the initial scope of works and quote details. Before we take hammers to the walls we have a pre-project start up meeting to execute the building contract. Then, we place orders for the materials and develop a project schedule to get your fitout completed as soon as possible! Get your hardhats, this is where your space meets our team properly. First we procure the site, then the work begins ensuring compliance to the project schedule. Now is the time you get to check out the finished product! We do a PC inspection with you, then rectify any defects and then hand the keys back over to you! Contact us today to talk about how we can renovate your workplace.